2/21/2017 - Memory Jar on a stick. But not Magus of the Jar. The motivation for this was to make the second half of the jar an event you have to make happen, instead of it happening immediately. Which has upsides and downsides. 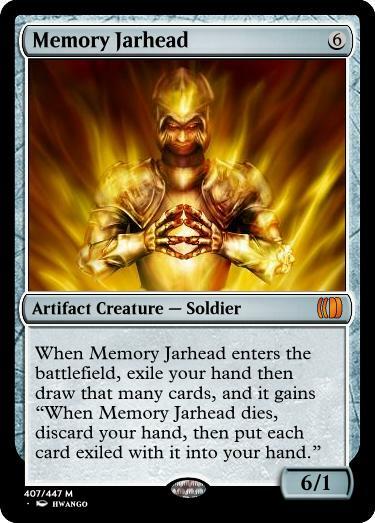 I feel you can't make a reference to Memory Jar and have it say "draw that many cards." What made Memory Jar famous is that it is draw 7 cards, and seven is a rather magical number. I don't remember choosing to differentiate there, and I agree with your reasons. The only downside is that's even stronger still. But if we also make it symmetrical, maybe then it works out. Agree, I don't so much dislike your original design as think the comparison to Jar would lead to unhappiness. I've played around with a mechanic in CC where creatures ETB with cards exiled under them, and those cards are basically in your hand (you can play them) until the creature dies, which this sort of reminds me of. 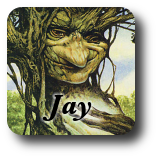 When ~ ETB's, exile the top three cards of your library face down under ~. As long as ~ is on the battlefield, you may look at and play cards exiled with ~. I like it. Feels base-red but I can see a block doing it in all 5 colors. Oh! That could definitely slot into red's impulse drawing.